For the type of lake, see moraine-dammed lake. The Neil Colgan Hut can be reached in 8 to 12 hours climbing the Perren Route from Moraine Lake. The blue-green color of the lake is due to glacial rock flour. On the reverse side of the 1969 and 1979 issues of the Canadian twenty dollar bill. In one of the main preview pictures for Google's operating system Android, Moraine lake was used as a background picture. In one of the backgrounds available on the Blackberry Pearl. In one of Windows Vista Starter wallpapers. In one of Windows 7's backgrounds in the "Canada" series. In one of Windows 7's backgrounds in the "Winter" series. As the Bing homepage on October 13, 2009, on October 2, 2013, and again on September 10, 2014. 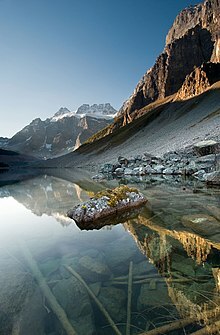 Wikimedia Commons has media related to Moraine Lake. Parks Canada - Banff National Park Visitor Information Centres, including hours of operation and contact information. Moraine Lake Video - Video and Geographic Position of Moraine Lake.